SAP is investing billions to redesign its flagship R/3 product line based on its ESA, and that ESA will become the standard framework for developing all new SAP ERP applications with NetWeaver. This book provides an overview of the core building blocks of SAP's new ESA, and shows how ESA works with the NetWeaver platform as well as mySAP ERP. As the term "ESA" implies, EA needs to be a key part of the strategy to be successful. How EA gets done varies widely by organization. The size of the enterprise, the way the function is organized, and, most important, the value placed on EA within IT (as well as your business) makes a huge difference. This section provides you with a baseline on the topic. Its purpose is to define the role of EA and how it applies to ESA adoption. Because the subject of EA is so vast, and its purpose and practice varies widely across organizations, this will certainly not be a definitive reference on the subject. EA is still a discipline that is more art than science. In fact, you or your team members may find some of the perspectives offered here, as well as many industry recommended practices, simply don't apply to your specific situation. That is certainly okay. If it triggers discussions in your organization to arrive at the right model for how EA practices will support your ESA adoption efforts, then the chapter has served its purpose. Although EA is traditionally a function performed mainly within IT, its purpose is to support the needs of the business. 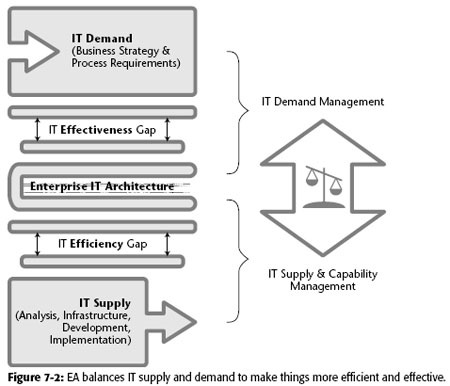 EA provides the strategic context for IT decision making. Think of this as the stewardship plan for IT to manage assets in a way that balances efficiency with maximum business agility. Remember, city planners have to do all this with an extremely long-term view and guaranteed uncertainty about changes in infrastructure, technology, social trends, external government mandates, and so forth. This is very much how IT planning works, as business requirements, processes, and technology in general are all guaranteed to change in unpredicted ways. Within a city, companies, organizations, and individual citizens have a great deal of freedom to develop their property underneath planning guidelines. This is similar to the way in which IT project teams need some freedom to deliver their solutions on time and within budgets. The city plan also accounts for the fact that malls, homes, hospitals, and neighborhood parks all have unique requirements that the plan must support. Likewise, transaction systems, business intelligence capabilities, and integration solutions all have unique roles the IT architecture must enable. 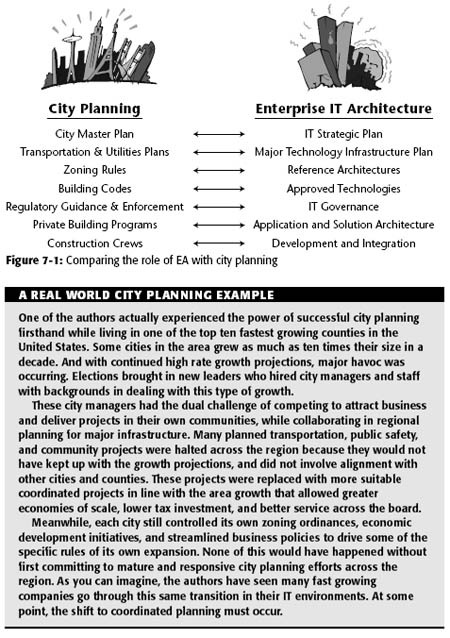 Figure 7-1 compares the elements of a city plan to that of an IT EA. Without city planning, chaos will eventually ensue when change occurs. Individual citizens and companies have no incentive to invest in support of the common good. Without the economies of scale of shared infrastructure, many beneficial projects will be too expensive to pursue. And, as many communities discovered, future expansion to things such as roadways, sewage systems, high-speed communications, and effective zoning are much more difficult to implement when things grow in an ad hoc way. Master planned communities find these changes are much cheaper and easier to bring about. Why are our most important projects far exceeding their schedules and budgets? Why do we have 14 different business intelligence products that don't work together? Why can't we pick an enterprise portal solution for the company? Why can't we change this business process faster? With an effective EA function, all the parts of the organization work better together and that ultimately shows up in faster, better, more effective IT support for the business. Ultimately, EA activities serve two purposes, as shown in Figure 7-2. First and foremost they must ensure IT strategic planning and investments (IT supply) is best aligned with business objectives (IT demand). Second, these plans and investments must add real value to implementation teams that are ultimately responsible for delivering IT solutions. In short, EA helps close the gaps related to IT's efficiency and effectiveness in supporting business innovation.